A new front in the ongoing battle between Everglades restoration and Florida’s sugar industry has opened up. This time, it’s over a planned water reservoir south of Lake Okeechobee. Environmentalists are suing to block an extension of sugar leases they say could delay construction. Senate Bill 10 was championed by former Senate President Joe Negron, whose Southeast Florida home of Stuart has been rocked by years of toxic water discharges from Lake Okeechobee. It was hoped the construction of the reservoir could do two things: clean the water before its released into smaller rivers downstream, and use that water to help restore the Everglades. The Federation is challenging the South Florida Water Management District regarding its decision to renew leases to sugar company Florida Crystals on land that is slated for the reservoir. The Federation learned of the move a day after it happened in early November. The lease extension is for up to eight years and the Federation argues that endangers construction of the reservoir. “Bottom line is, we don’t want an argument over leasing to slow down moving forward on the reservoir and we think that’s a potential problem that can happen," says Fuller. Fuller and the Federation are taking issue with the short-notice that was given to the public, arguing Florida law prohibits last minute lease deals. But new state Senate President Bill Galvano told reporters in November he didn’t have a problem with it. “I think we watch those issues. The management district was acting in its authority and based on the timelines that exist so I did not have an issue with the renewal of the lease." Yet, Florida’s Governor-elect, Ron DeSantis, might. DeSantis, along with incoming state Agriculture Commissioner Nikki Fried, are no fans of the Sugar Industry. Both blasted it during the course of their campaigns. The Everglades Trust even endorsed DeSantis for governor. Meanwhile, one of the largest agriculture companies, U.S. Sugar, is moving to terminate an option for the state of Florida to purchase 150,000 acres of its land. The Florida Wildlife Federation’s Fuller doesn’t want to see that happen because he says ongoing Everglades restoration requires more land. U.S. Sugar says that land was never part of the Comprehensive Everglades Restoration Plan which was approved by Congress in 2000, nor was it a part of any other restoration plan. Company spokeswoman Judy Sanchez says the state law that authorized the reservoir allows for the option to purchase land to be terminated and sehe calls Fuller's comments "noise." “There have never been any planned restoration projects for that land. Ever. It’s all been noise and I guess, objector voices out there," she says. U.S. Sugar produces 10 percent of the sugar consumed in the country each year. The acreage in question is used to grow winter crops like sweet corn, and green beans. It’s been actively farmed for nearly 90 years. Sanchez says the idea to use the land for potential Everglades projects was just that: an idea—which the 2008 global downturn largely nixed. “It was a grandiose idea or plan that was a, ‘maybe it would be nice to have this land in our back pocket’ when it was proposed. but the recession happened and it was never brought to fruition. Now there’s language in Senate Bill 10 that says…move forward with Everglades Agricultural Reservoir," Sanchez says. Still, U.S. Sugar says it continues to support the reservoir project, and wants to see it completed as soon as possible. So does the Florida Wildlife Federation. There’s been no timeline for when and how construction on the project will proceed. When President Donald Trump signed off on the project in October former Senate President Joe Negron said he’d like to see the state break ground in the Fall and have it completed within three-to-five years. *Clarification: The FWF is suing the SFWMD over leases to Florida Crystals. U.S. Sugar is not a party to this lawsuit. 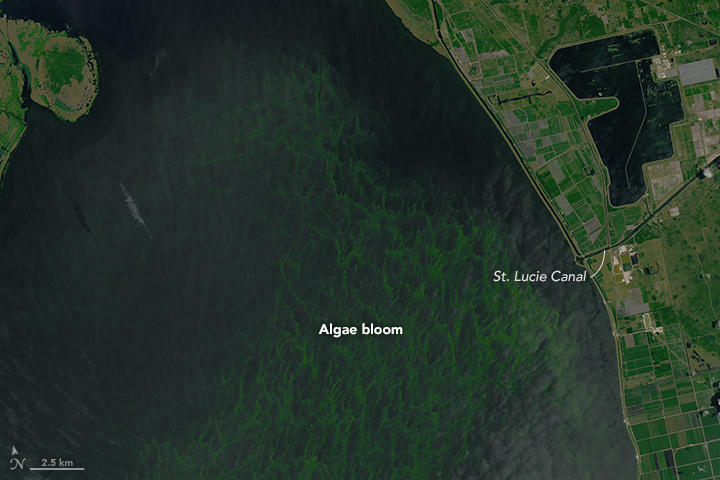 Construction of a reservoir south of Lake Okeechobee that state lawmakers envision as a way to help a region beset by toxic algae blooms was part of a wide-ranging water bill signed Tuesday by President Donald Trump.